Patrolapart can offer a number of solutions for customers with ZD30 Common Rail Patrol’s and TD42 Patrols. Our objective is to offer a Cost Effective and Reliable package. We put a high importance on reliability and improving the efficiency of the vehicle. Done correctly this will result in Greater Performance. There is a few options available and can be offered as Compete packages, or performed in stages. Results vary from vehicle to vehicle and hence Percentage gains are a more accurate way to estimate increase in performance. The first step to help improve performance for the Common Rail is to fit a 3" Redback Extreme Exhaust System and adjust the boost levels from factory. By fitting a Patrolapart 3" Redback Extreme Exhaust System with Catalytic convertor and muffler (https://patrolapart.com.au/product/nissan-patrol-gu-zd30-3-redback-exhaust-with-resonator-cat/nissan-patrol-gu-zd30-3-redback-exhaust-with-resonator-cat) and setting the boost level to 16psi using a HPD VNT Boost Controller ( https://patrolapart.com.au/product/hpd-dawse-valve-vnt-boost-controller-suit-all-zd30-models/hpd-dawse-valve-vnt-boost-controller-suit-all-zd30-models ) we have seen significant improvement over standard. Air Fuel Ratio (AFR) increased resulting in Lower EGT Temperatures. Second Step is to fit an aftermarket Intercooler kit to increase the cooling capacity, so the air going into the engine is much cooler than factory. 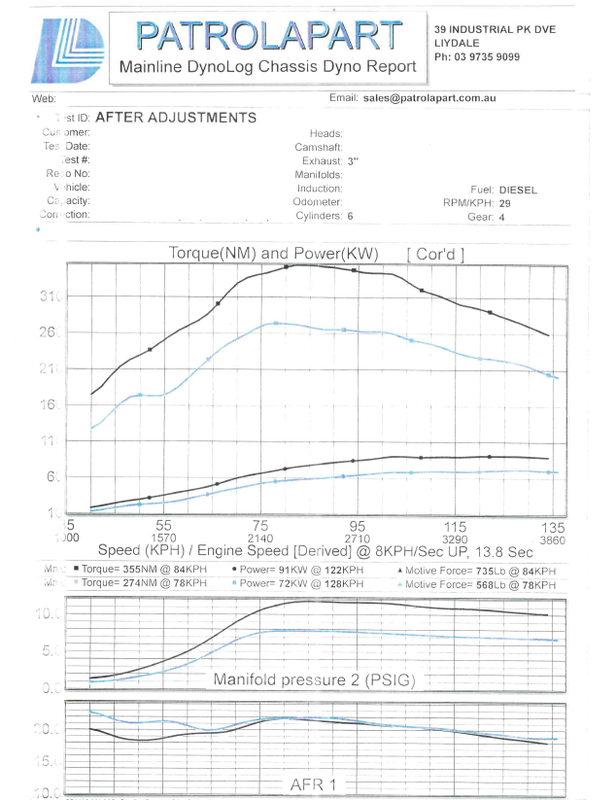 For our test vehicle, we have fitted the HPD Series 2 Kit ( https://patrolapart.com.au/product/hpd-intercooler-kit-nissan-patrol-gu-zd30cr-upgrade-series-2/hpd-intercooler-kit-nissan-patrol-gu-zd30cr-upgrade-series-2 ). This kit comes in two sizes, the smaller kit utilises the factory bracket and scoop but comes with new silicone hoses and aluminium pipes and the larger kit (as tested) comes with a new Intercooler bracket, larger scoop and different piping than the smaller kit because it is much larger in size. 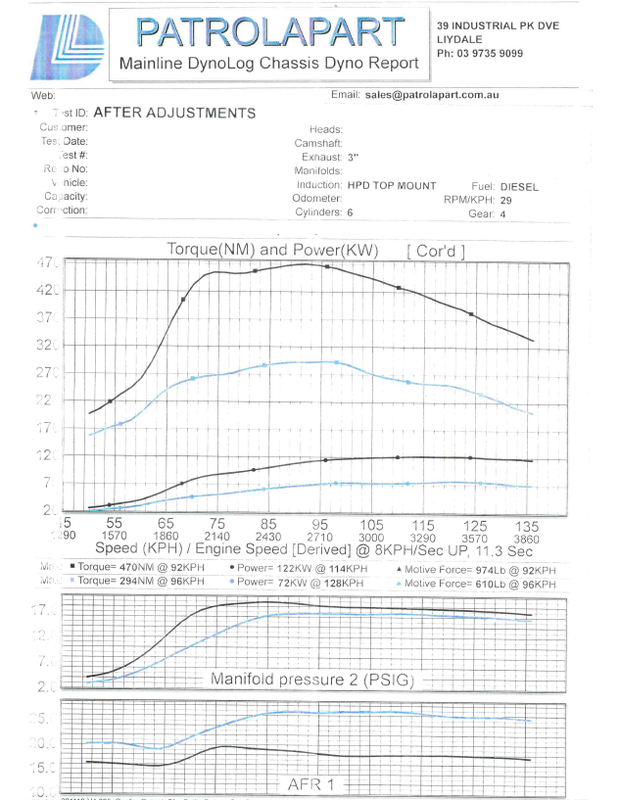 The main gain with fitting the larger Intercooler was a huge drop of EGT Temperatures. On our test vehicle we saw a 100deg drop in EGT temps at this stage over standard. AFR ratio increased even further. Third Step is where all the previous upgrades are used to maximise the efficiency and performance of the engine. The ECU of the car is RE-MAPPED on the dyno to give us the best result for Boost, AFR and drivability. No plug in modules or chips are fitted, all changes are made to the factory ECU itself. Remember that performance gain is a result of improvements made and should not be the ultimate goal over reliability. 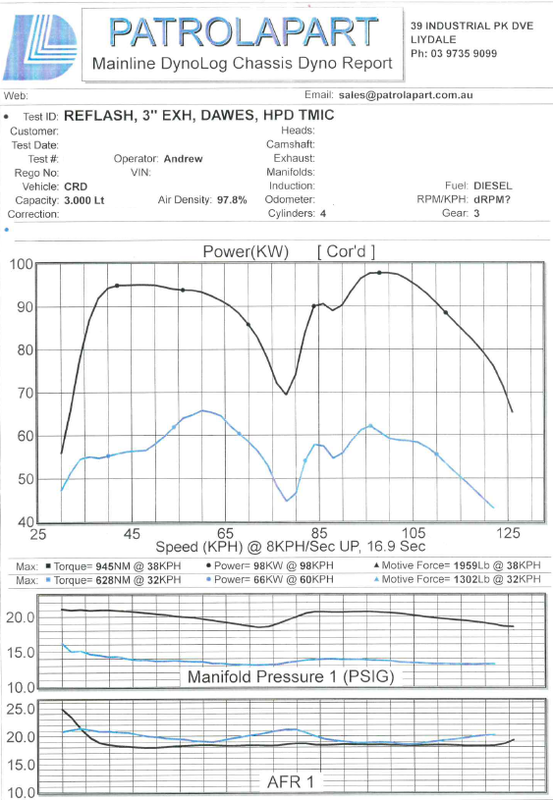 You can see from the dyno sheet below that performance is increased by 50% over standard. The dip in the graph is from where the auto changed gears. The Black line is from after the upgrades, and blue is in standard vehicle form before we started. Stage Four is where we really add performance to the vehicle. Along with all the previous upgrades, the Turbo charger is changed to a UFI Turbo which has been designed to handle more boost pressure. The combination of increased volume and pressure through the turbo is what impoves performance of 80% over standard. Every Vehicle will see slightly different results, varying from transmission type, tyre size and driving style. Please contact Patrolapart on 03 9735 9099 for any more information on any of this, or come instore to have a chat wi th us about upgrades for your Patrol. The first step to help improve performance for the Nissan Patrol GU TD42 Turbo engine is to fit a 3" Redback Extreme Exhaust System and adjust the boost levels from factory. By fitting a Patrolapart 3" Redback Extreme Exhaust System with a muffler and this also includes the dump pipe (https://patrolapart.com.au/product/nissan-patrol-gu-td42-3-redback-exhaust-with-res-dump-pipe/nissan-patrol-gu-td42-3-redback-exhaust-with-res-dump-pipe) and setting the boost level to 12psi using a HPD Boost Controller ( https://patrolapart.com.au/product/hpd-turbo-boost-control-wastegate-bleed-off/hpd-turbo-boost-control-wastegate-bleed-off ) we have seen significant improvement over standard. Second Step is to fit an aftermarket Intercooler kit to increase the cooling capacity, so the air going into the engine is much cooler than factory. For our test vehicle, we have fitted the HPD Series 2 Kit ( https://patrolapart.com.au/product/nissan-patrol-gu-td42ti-hpd-series-2-large-intercooler-kit/nissan-patrol-gu-td42ti-hpd-series-2-large-intercooler-kit ). This kit comes in two options, one for factory intercooled engines, and one for non factory intercooled engines. There is also a few different options available for this kit, the smaller kit for the factory intercooled engines utilises the factory bracket and scoop but comes with new silicone hoses and aluminium pipes. For the Non Factory Intercooled engines, this smaller kit comes with a small bonnet scoop, the brackets for the intercooler and all the silicone & aluminium hoses required. The larger kit (as tested) comes with a new Intercooler bracket, larger scoop and different piping than the smaller kit because it is much larger in size. Both the large kits coming with the same parts, the only difference is the intercooler mounting bracket it slightly different where it mounts to the radiator support panel. The main gain with fitting the larger Intercooler was a huge drop of EGT Temperatures. On our test vehicle we saw roughly a 100deg drop in EGT temps at this stage over standard. AFR ratio increased even further. Third Step is where we really add performance to the vehicle. Along with all the previous upgrades, the Turbo charger is changed to a UFI Turbo which has been designed to handle more boost pressure. The combination of increased volume and pressure through the turbo is what impoves performance greatly over standard. Every Vehicle will see slightly different results depending on tyre size and driving style. We tune every vehicle to suit its specific requirement, a tow vehicle will get a very different tune to a Weeekend bush car. Please contact Patrolapart on 03 9735 9099 for any more information on any of this, or come instore to have a chat with us about upgrades for your Patrol.